Bit of Pop: This Book is Full of Straight Up Tasty Recipes! This Book is Full of Straight Up Tasty Recipes! I am a cookbook fan - I love to learn something new from someone who loves to cook, whether presented by a well-trained and placed chef, or by a next-door casual cook. 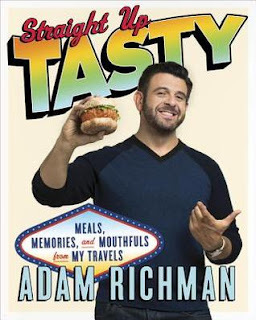 Adam Richman's Straight Up Tasty is a light and lively read, well-matched to his TV persona, and is filled with a great variety of recipes. I have several on my To Try list, and can't wait to share with family and friends. As with most cookbooks I like, I will be "Currently Reading" this one for quite some time! I received a copy of this book from Blogging for Books for review purposes.